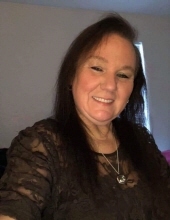 Sandra Lena Goodyear, 54, of Texas, formerly of Garwood, New Jersey died on Saturday, March 30, 2019. Born on December 3, 1964 to Arthur Goodyear Senior and the late Doris May Goodyear. She was a dedicated worker of Federal Express where she proudly received Gold and Titanium Certificates. Sandra was also heavily involved and loved by the deaf community where she gained her lifelong friends. She is survived by her father, Arthur Goodyear Sr.; bothers Arthur Goodyear Jr., Dennis Goodyear, and Karl Goodyear; sister-in-law Donna Goodyear; nieces, Allison Goodyear, Erica Goodyear, and Sarah Goodyear. Services will be held at Dooley Funeral Home at 218 North Avenue, Cranford, New Jersey. Burial will be at Graceland Memorial following funeral services. To send flowers or a remembrance gift to the family of Sandra L Goodyear, please visit our Tribute Store. "Email Address" would like to share the life celebration of Sandra L Goodyear. Click on the "link" to go to share a favorite memory or leave a condolence message for the family.